Sheepherder Wants Special Treatment from Idaho Legislature. Sheepherder Ron Shirts has appealed to the Idaho Senate to intervene and give him special consideration above the interests of the public, wildlife, and the Nez Perce Tribe. Shirts complains that his livelihood is threatened because the Payette National Forest is not living up to an agreement made in 1997 when bighorn sheep were transplanted to Hells Canyon. The article fails to mention that this agreement did not include the Nez Perce Tribe who still hold treaty rights to grazing and hunting in the area which supersede those of Shirts and other sheepherders. In response to a federal lawsuit filed on behalf of Western Watersheds Project to protect bighorn sheep in Hells Canyon, the Payette National Forest is drafting a plan which could substantially reduce domestic sheep grazing on its forest. Disease is the major concern here, when domestic sheep and bighorn sheep intermingle it is thought that Mycoplasma ovipneumoniae is passed from domestic sheep to bighorn sheep causing pneumonia. In fact, in October a bighorn sheep lamb was found on the South Fork of the Salmon River near Hettinger Ranch and preliminary tests indicate it was killed by pneumonia. For many reasons, not least of which is protection of bighorn sheep health, this reduction in grazing would be beneficial. The area north of McCall, Idaho, where the closures are most likely, has become important summer elk habitat and, in turn, important wolf habitat which is invaded each year by large bands of domestic sheep. This is one of the areas where wolf mortality from Wildlife Services is a perennial problem because of the conflicts caused by domestic sheep grazing. You can comment on the plan until March 3rd, 2009. This draft Forest Service map shows the range of bighorn sheep in Idaho and the boundaries of Forest Service domestic sheep allotments occur. Notice that there are other areas where a similar situation occurs, particularly in the White Cloud Mountains, Lost River Range, and other areas. Currently there is a interim strategy in place which calls for the Idaho Fish and Game Department to kill bighorn sheep seen intermingling with domestic sheep and goats, which are also thought to transmit the disease. Also, Bush’s former undersecretary for natural resources with the Department of Agriculture Mark Rey recently issued a Memorandum of Understanding which would cede wildlife management power from the states to the Federal Government by forcing the states to show that bighorn sheep are disease free before they could be relocated to Federal lands. Meanwhile there has been another effort to create a new strategy in an attempt to maintain the viability of sheepherders using a collaborative process among a yet-to-be determined group. You can see the notes of the first meeting here. “Wouldn’t you like to know?” said New Plymouth Republican Sen. Monty Pearce when asked about a bill he is preparing. Payette forest planner Pattie Soucek, 53, said the 1997 agreement does not legally apply to the Payette Forest. Using the 1997 letter to set grazing standards in the forest would be a violation of several federal laws, including the National Forest Management Act. Both articles mention legislators who might be planning to introduce legislation. 13 Responses to Sheepherder Wants Special Treatment from Idaho Legislature. Sounds like things are being set in motion to make Idaho a National Laughing Stock again. Didn’t I just hear Barack Obama in his inauguration speech talk about Science? Butch Otter, former Sheepman now LT. Gov. Brad Little (freshly appointed by Butch) and the Idaho Legislature are about to declare they don’t believe in the germ theory – that somehow bighorns don’t die from contact with domestic sheep. At the same time that the local radio station plays stories about Otter’s budget cuts hurting schools and special needs kids – these Bozos are running around spending all their time sticking up for a welfare rancher who is a big drain on state and federal taxpayers. Plus, Butch Otters keep throwing money at the Caine Vet Lab and Marie Bulgen’s anti-germ theory junk “research”. Dr. Bulgen is/was an officer in the Woolgrowers. Waht a bunch of wasteful ninnies! domestic sheep also pose a threat of spreading Q fever to humans. and let’s not forget that the Ron Shirts couldn’t account for his sheep on the allotment – there are a number of official accounts documenting trespassing domestic sheep in bighorn habitat. there are maybe 4 sheepman whose domestic sheep conflict with bighorn – yet the Idaho legislature flips over backward to placate this miniscule group. Too bad someone couldn’t put the numbers in Otter’s face that the bighorn sheep clearly are worth more money then those lousy domestic sheep will ever be worth. Plus look at all the damage they do to our public lands. Maybe those welfare ranchers should go get a job at the local walmart store as greeters. If this rancher doesn’t like it, he needs to get his sheep of public land. Not only does Shirts get a quarter mill in “commodity” subsidies for “producing” something nobody wants – like mutton, he pays $1.35 a month to graze FIVE ewes and however many lambs they can suckle on public lands, spreading disease in their wake. That’s less than 30 cents per germ-laden domestic sheep. Number 2 recommendation to President Obama (Next to Number 1 recommendation to send Wildlife Services off harassing nutria and hazing geese): End both public lands grazing – and subsidies like this to public lands welfare sheep ranchers. And I betcha: The Payette Forest, Mark Rey et al. have squandered half a million dollars if not more in Administrative costs trying to deal with this No-Brainer situation kept alive by the likes of Otter, Larry Craig and now apparently Little the Lt. Gov. And I couldn’t help but notice: In 2002, Shirts had some kind of “disaster” that netted $37,000 of our tax dollars. That seems like the same year I had my own disaster – called replacing a transmission in a 4 Runner. No one subsidized that several thousand dollar “disaster”. What’s up with the $37,058 disaster subsidy in 2002? I didn’t see anything on the fire maps that would indicate that it was from fires. I have no idea, likely “drought” – which is a natural part of life in the arid West. I also kind of recall the welfare sheep ranchers hadn’t been getting all those wool and mutton and hide subsidies, and then rancher-loving Larry Craig helped them get them again — around that time. Plus 2002 was the height of not questioning much of anything, and the country was still flush with money before Bush ran it into the ground. Kt what are you going to do when you can’t blame Bush for everything that goes wronge? I think that there is plenty of blame to go around for the whole houseing mess, heres a little u tube video, after you watch it tell me thats its still all bushes fault. Now there’s great source for ya, Faux News. I seriously doubt that Republicans would have allowed any regulation to actually be passed. I don’t see that KT has blamed Bu$hCo for this but his administration has definitely tried to influence this issue with Mark Rey’s interference. Seems to me that you just like to rile kt up. Holy cow! What in the hell do these people expect? Not only do they get our bighorn sheep, wolves and other predators but they get hundreds of thousands of dollars from us too. The reporter for this story didn’t even bother to talk to anyone with opposing views, just W. Alan Schroeder, Shirts, and Little who are all part of the ranching oligarchy of this state. What sloppy reporting. Fish and Game has killed 6 bighorns under Otter’s policy. Where did this occur? Was it justified in all cases? It’s crazy – you have Butch Otter, Brad Little and others acting to froth up the the Legislature saying there’s no problem, really, with disease – and then the turn around and have the IDFG puppets kill bighorns suspected of contact. I am not saying that bighorns that come into contact should NOT be removed to keep disease from spreading. But first and foremost is prevention – and prevention means getting those Shirts sheep out of Hells Canyon/Salmon River country. And like everything else in Otter’s fascistic (state and public lands grazing industry are one) Idaho, including wolf killing, no one trusts IDFG anymore to make untainted decisions. 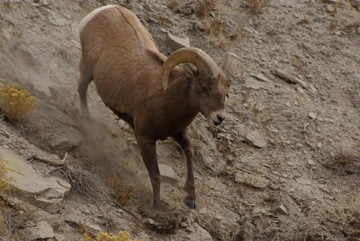 Either about wolf “depredation” or domestic sheep-bighorn contact. You know – behind this all is the fact that Otter, Little, Shirts et al. will not accept that bighorns have a right to be here, and that domestic sheep make bighorns die. This is once again the resurrection of nonsense trying to claim that domestic sheep don’t carry diseases that make bighorns die. I wonder if Larry Craig has already taken a Woolgrower lobbying gig? Just speculation on my part. If not, this is just the kind of thing that is up his alley – lying about science in regards to anything to do with public land – and – uh – just plain lying in general. He spent his entire career doing the cowboy and sheepmen bidding in DC. including getting those handsome welfare (subsidy) payments to Shirts et al. Of course, he may have to be kind of closeted, work behind the scenes, not himself pop up in the Legislature. A shadow head of the Woolgrowers and Cattlemen … Maybe that’s why they are building those underground rooms – his kind of place.